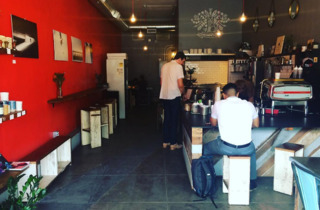 Stop into this cozy neighborhood spot for a (strong) pour of Wrecking Ball Coffee from the owner/barista Saadat Awan, who's always around with a smile. It's a good spot to meet a friend or get some work done (there's wifi here, unlike Blue Bottle down the street...) and the no-frills design means more space to sit and sip. The benches out front are a good alternative if it's too packed inside, as long as you don't mind sharing your seat with the pups that usually get tied there to wait for their owners to perk up.